September 24, 2012: The Planning Commission held a meeting to explore the prospect of collaborating with Heartfile Health Financing (HHF)—Heartfile’s innovative social protection program, which aims to help the poorest of the poor in Pakistan from catastrophic shocks. The meeting was chaired by the Deputy Chairman, Mr. Nadeem Ul Haq. Participants included stakeholders representing various ministries of the Government of Pakistan in addition to a number of development partners and expert. Our President, Dr. Sania Nishtar gave a presentation on the HHF system which stirred an interest in its potential for up-scaling and its potential for collaborations. The Planning Commission has devised to form a Working Group to follow up on this consultation. 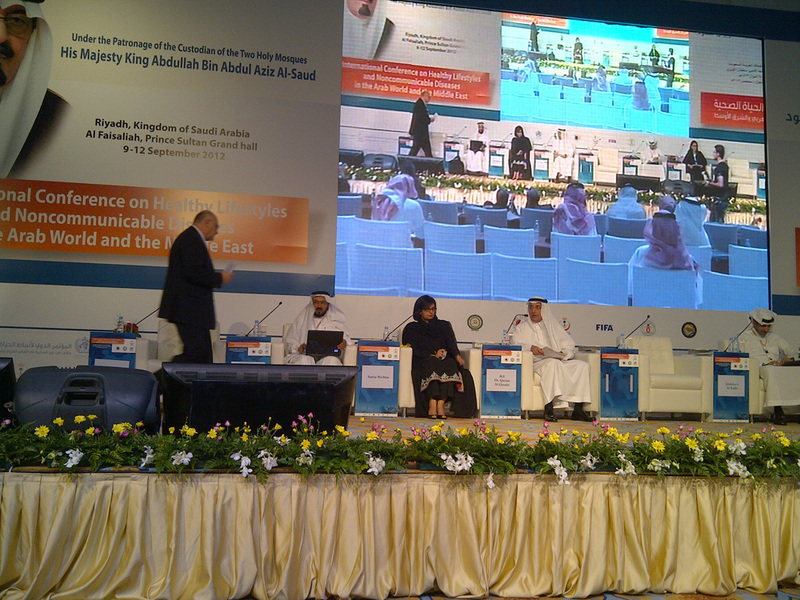 September 14, 2012: The Saudi Arabian Ministry of Health and the WHO East Mediterranean Regional Office jointly organized an International Conference in Riyadh September 10-12. Participants including government and non-government stakeholders in the region had the opportunity to re-assess their commitment for prevention and control of NCDs. The Conference issued a “Riyadh Commitment” which emphasized on the participants’ desire to making the UN General Assembly Political Declaration on NCD Control and Prevention a success story in the EM Region. Our President, Sania Nishtar was a plenary speaker and gave a global overview of NCDs. 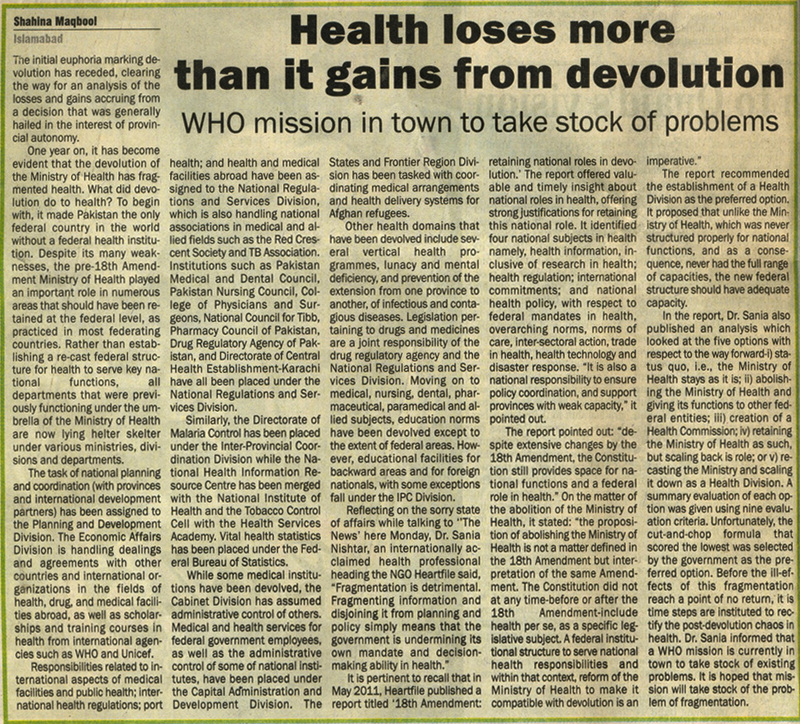 Health loses more than it gains from devolution, WHO mission in town to take stock of problems, by Shahina Maqbool published in The News International, September 11, 2012. September 7, 2012. The 20th IPPNW World Congress was recently held in Hiroshima, Japan. The host organization, the “International Physicians for Preventing Nuclear War” is the Nobel Peace Prize-winner union of physicians around the world. The congress themed this year, “From Hiroshima to Future Generations” supported its commitment towards global peace building. 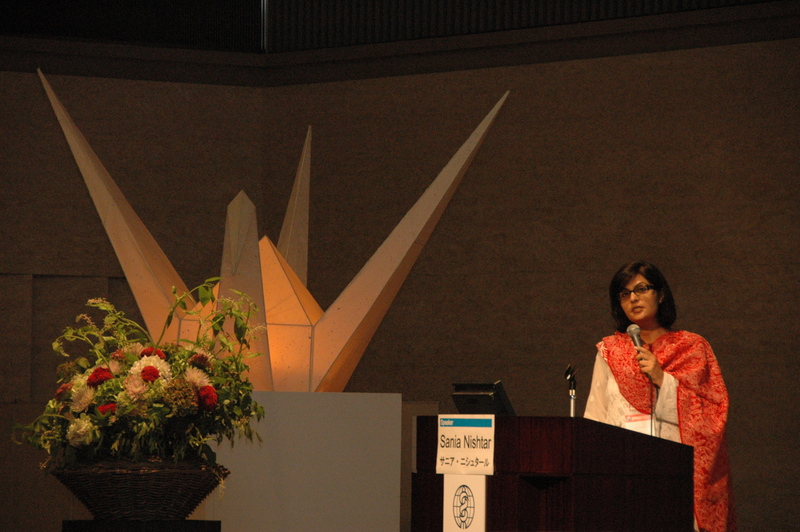 Dr. Sania Nishtar was a plenary speaker in the session titled “World without Structural Violence and Human Security”. Her talk centered on the intersections between human security and peace.